This is a great Alfredo Sauce. It is so quick and easy and the texture always turns out right. The cream cheese in this gives it the perfect texture. I also like it because most alfredos call for cream. I don’t usually keep cream on hand but I do usually have cream cheese on hand to use in desserts and frostings. I use this as a side dish served with roast, chicken, or pork steaks. 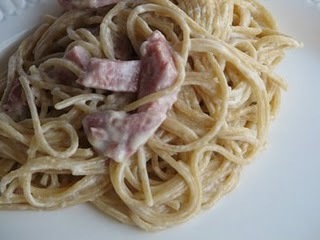 It also makes a good main dish if you add ham or chicken. I have also used this sauce to make chicken alfredo pizza. I know this is not the healthiest but it is a nice quick meal. 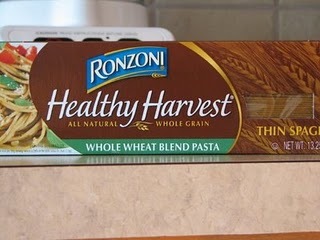 When I made it last week, I used whole wheat pasta, that makes it healthy right? This sauce does make a lot. When I make it for my family I usually half it. We tried this tonight and everyone really liked it – thanks! Just made this tonight and it was delicious! I have a ton of sauce left- can it be frozen? Sorry it took me so long to get back to you. I think the texture on this might change if it is frozen, but it would probably be worth trying a little bit of it to see. Made this tonight….oh, my, word! Saying the whole family enjoyed it is an understatement! Thank you so much! I am glad you enjoyed it. I have not made this in awhile and need to put it on the menu plan again.